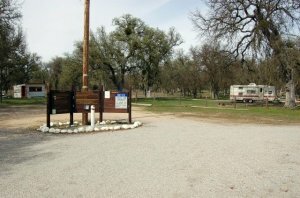 We drove through campground while visiting the Fort from Camp Roberts RV park. As stated in the description this is very much a primitive campground. At entrance to campground a price is listed for full hook-ups ($15). Best we could see were two sites near the entrance what appeared to be water and electric. Didn’t see any sewer hoses connected to anything, so not sure where the “full” hook-ups are located, suspect non- existence. Remainder of campground is very rough, with some rigs looking like they are permanent hunt camps. Location has lots of trees and open space available between sites. Certainly not a location to visit unless looking for a rough and rugged experience. Fort has a mini-BX, mini-Commissary, and gas station.